Only two months ago Swedish House Mafia played their final show at Ultra Music Festival. Since then, Sebastian Ingrosso & Axwell have launched their new project Departures, Steve Angelo has been locking in dates to perform globally & Axwell released his debut solo track Centre of the Universe. only days ago SHM’s social media platforms we’re reignited with the simple post ‘…’ Shortly after, a four minute mini-movie titled ‘Leave The World Behind’ was dropped. It features each member throughout the clip doing various things, along with a rendition of their same titled track, sung by vocalist Lune. 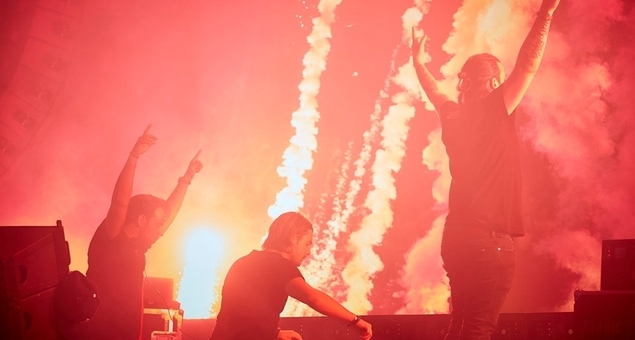 We can only suspect that a Swedish House Mafia Documentary is in the making. This entry was posted in Blogs, Upcoming events and tagged '...', axwell, Centre of the Universe, Departures, DJ Central, Documentry, Leave the World Behind, Lune, mini-movie, sebastian ingrosso, SHM, Social media platforms, Steve Angelo, swedish house mafia, ultra music festival on May 21, 2013 by bppdjcentral. Sebastian Ingrosso & Axwell have confirmed their new project, that will take residency Ushuaïa Beach Hotel. Over the European summer the duo will showcase their new project on a weekly basis, starting June 12. This entry was posted in Blogs, DJs, HOT!, Music and tagged axwell, Dance Music, DJ, djcentral, EDM, electronic, swedish house mafia on April 24, 2013 by bppdjcentral. Inthemix’s Jack-T goes back stage with “The Swedes” on their final Australian tour to reflect on how the game has changed for them and to give us one last insight into small beginnings and epic endings. International Dance Music Awards – Voting Now Open! The International Dance Music Awards (IDMA) nominees have been announced and voting is now open for you to have your say. The awards are held at the Winter Music Conference in Miami in March. With 55 categories ranging from Best Underground Track to best Global Club, they have got the entire dance music scene covered! Who will win your vote?? You can cast your vote here and voting closes on March 1st. This entry was posted in Awards, DJs, HOT! and tagged afrojack, Armin Van Buuren, David Guetta, Deadmau5, IDMA, international dance music awards, kaskade, markus schulz, swedish house mafia, Tiësto, winter music conference on February 2, 2013 by bppdjcentral.